As far as YOU’RE concerned, it was a pretty boring night in the shop. All I did was move about 500 clecos one hole over and then matchdrill the remaining holes in the right wing bottom skin. No big deal, but now the whole right wing is done being matchdrilled. Per the instructions, I can remove the bottom skins and get to work on the tank. Instead, I’m going to get back to work on the left wing, and then get to work on both tanks at the same time. Because of all the pictures in the last post, I’ve decided to go easy on the repetitive picture thing. 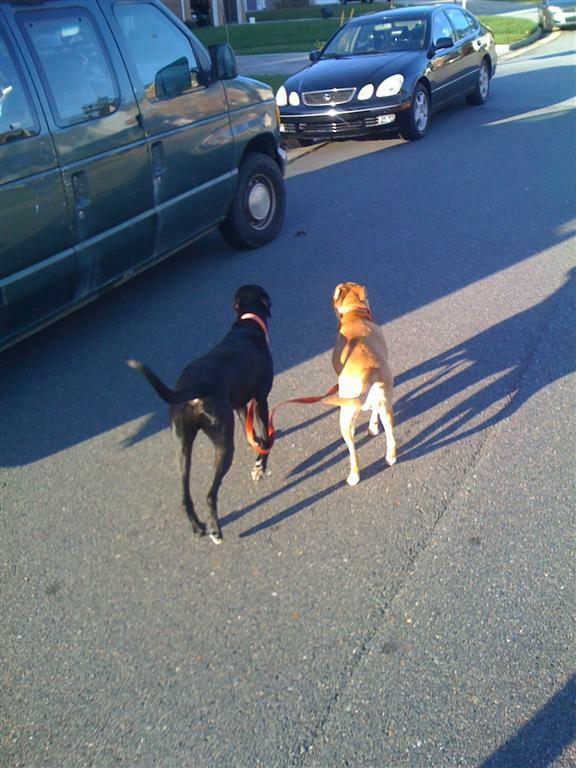 Jack and Ginger, walking each other down the street. This entry was posted on Saturday, February 12th, 2011 at 11:00 pm and is filed under Wings. You can follow any responses to this entry through the RSS 2.0 feed. You can leave a response, or trackback from your own site.